The Sandham Memorial Chapel reopened today August after a year-long restoration costing £400,000. 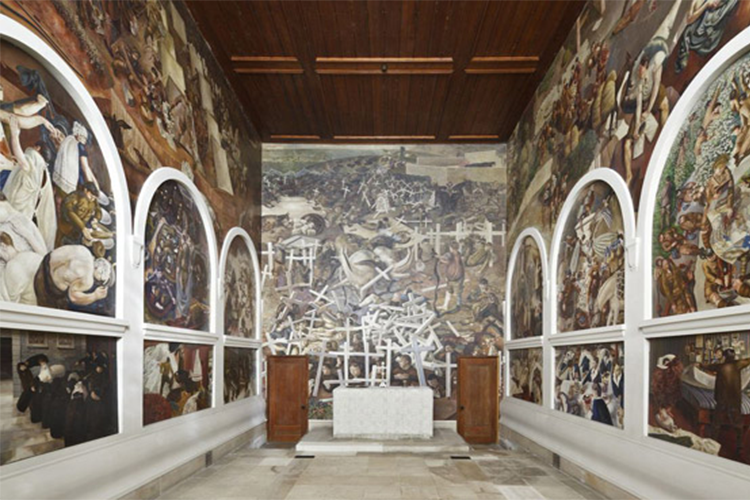 The chapel is decorated with a suite of paintings by Stanley Spencer which are inspired by the artist's experience during the First World War. The chapel was built and paintings commissioned by the arts patrons John Louis and Mary Behrend to commemorate Mary's brother, a casualty of the war. Stanley's paintings are based on his life as an orderly at a military hospital in Bristol in the west of England and as a soldier on the frontline. The pieces are painted between 1927 and 1932 from memory, the canvases focus on the everyday aspects of his life as a soldier including tasks such as washing lockers, scrubbing floors and making tea. The canvases - excluding the three which are permanently fixed to the walls - have been on loan for the past year to exhibitions at Somerset House in London and Pallant House Gallery in Chichester, West Sussex. The Grade I listed chapel in Burghclere, Hampshire, and the two alms houses that flank it were built in 1926. As part of the restoration the cottages have also been stripped back to their original features. The paintings will go on loan once more to the Manchester Art Gallery in November for four months. But the touring shows have raised questions about how best to light the paintings. Spencer stipulated in 1958 that there should be no artificial lighting in the chapel.